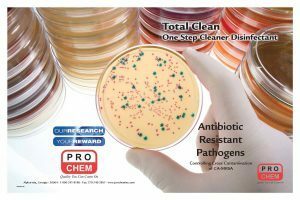 TOTAL CLEAN | Pro Chem, Inc.
TOTAL CLEAN is the first formula ever to carry CA-MRSA kill claims on hard surfaces, including artificial turf. It combines the activity of quaternary ammonium compounds with powerful cleaning agents. It is a one-step cleaning and disinfecting product that saves time and money since it does not need to be rinsed off. TOTAL CLEAN provides broad-spectrum effectiveness against gram-positive and gram-negative bacteria including Community Acquired-Methicillin Resistant Staphylococcus Aureas (CA-MRSA), Vancomycin Resistant Enterococcus (VRE) strains, viruses (including HIV-1, HBV, and HCV), as well as pathogenic fungi including T.mentagrophytes (athlete’s foot fungus). TOTAL CLEAN is designed for use as an all-purpose cleaner and disinfectant as a part of regular maintenance programs. It is safe on a variety of hard surfaces found in sports venues, training camps, schools, universities, locker rooms, playgrounds, health clubs, childcare facilities, prisons/jails and veterinary clinics. 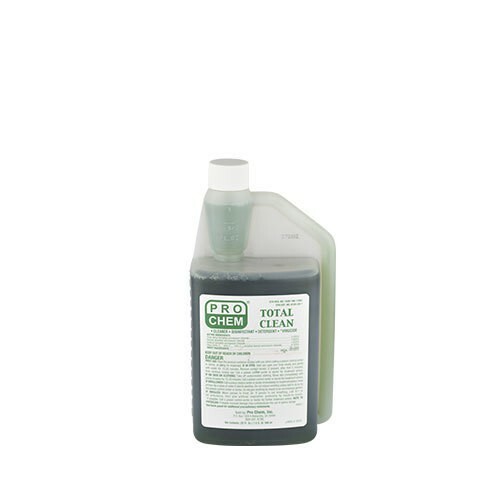 This highly concentrated cleaner provides an economical solution to a total cleaning program. When diluted according to the directions, each box of 6 – 32 ounce bottles will provide 192 gallons of disinfectant. Cleans floors in hospitals, vet offices, nursing homes, etc. It is a violation of Federal Law to use this product in a manner inconsistent with its labeling. This product is not for use on critical and semi-critical medical device surfaces. DISINFECTION: To disinfect inanimate, hard nonporous surfaces add 1 ounce of this product per gallon of water. Apply solution with a mop, cloth, sponge, hand pump trigger sprayer or low pressure coarse sprayer so as to wet all surfaces thoroughly. Allow to remain wet for 10 minutes, then remove excess liquid. For sprayer applications, spray 6-8 inches from surface, rub with brush, sponge or cloth. Do not breathe spray mist. For heavily soiled areas, a precleaning step is required. Surfaces which may contact food must be rinsed thoroughly with potable water after use. BACTERICIDAL STABILITY OF USE-SOLUTION: Tests confirm that this product when diluted at 1 ounce/gallon in hard water up to 400 ppm (as CaCO3) remains effective against Pseudomonas aeruginosa, Staphylococcus aureus and Salmonella enterica subsp. enterica serovar choleraesuis for up to 1 month when stored in a sealed container such as a spray bottle at room temperature. If the product becomes visibly dirty or contaminated, the use-solution must be discarded and fresh use-solution prepared. Always use clean, properly labeled containers when diluting this product. Bactericidal stability of the use-solution does not apply to open containers such as buckets or pails. To disinfect food processing premises: Before using this product, food products and packaging materials must be removed from the area or carefully protected. For floors, walls, and storage areas, add 1 ounce of this product per gallon of water. For heavily soiled areas, a pre cleaning step is required. Apply solution with a mop, cloth, sponge, hand pump trigger sprayer or low pressure coarse sprayer so as to wet all surfaces thoroughly. Allow to remain wet for 10 minutes, then remove excess liquid. After use, all surfaces in the area must be thoroughly rinsed with potable water. To disinfect restaurant food contact surfaces: Countertops, appliances and tables: Add 1 ounce of this product per gallon of water. For heavily soiled areas, a precleaning step is required. Apply solution with a cloth, sponge or hand pump trigger sprayer so as to wet all surfaces thoroughly. Allow the surface to remain wet for 10 minutes, then remove excess liquid and rinse the surface with potable water. This product cannot be used to clean the following food contact surfaces: Utensils, glassware and dishes. BACTERICIDAL ACTIVITY: At the 1 ounce per gallon dilution, this product demonstrates effective disinfectant activity against the organisms: Pseudomonas aeruginosa, Salmonella enterica subsp. enterica serotype choleraesuis, Staphylococcus aureus, Bordetella bronchiseptica, Corynebacterium ammoniagenes, Enterobacter aerogenes, Enterobacter cloacae, Enterococcus faecalis, Escherichia coli, Escherichia coli (clinical isolate), Escherichia coli 0111:H8, Fusobacterium necrophorum, Klebsiella pneumonia subsp. pneumoniae, Listeria monocytogenes, Pasteurella multocida, Proteus vulgaris, Proteus mirabilis ATCC 25933, Salmonella enterica subsp. enterica serotype typhi, Serratia marcescens, Shigella sonnei, Shigella flexneri Type 2b, Shigella dysenteriae, Staphylococcus epidermidis, Streptococcus pyogenes (Clinical – Flesh Eating Strain BIRD M3), Vancomycin resistant Enterococcus faecalis (VRE), Methicillin resistant Staphylococcus aureus (MRSA), Vancomycin intermediate resistant Staphylococcus aureus (VISA), Community Associated Methicillin resistant Staphylococcus aureus (CA-MRSA) NRS 123 Genotype USA400, and Community Associated Methicillin resistant Staphylococcus aureus (CA-MRSA) NRS 384 Genotype USA300, Gentamicin resistant Acinetobacter baumannii. MILDEWSTAT: To control mold and mildew (Aspergillus niger) and the odors they cause on pre-cleaned, hard, nonporous inanimate surfaces add 1 ounce of this product per gallon of water. Apply solution with a cloth, mop, sponge or hand pump trigger sprayer making sure to wet all surfaces completely. Let air dry. Prepare a fresh solution for each use. Repeat application at weekly intervals or when mildew growth appears. To Control Mold and Mildew on Large, Inflatable, Nonporous Plastic and Rubber Structures (animals, promotional items, moonwalk, slides, obstacle course play exercise equipment, and wrestling mats): Thoroughly clean all surfaces with soap or detergent and rinse with water. Saturate surfaces with a use solution of 4 ounces of this product per 4 gallons of water (1 ounce per gallon of water) (850 ppm active quaternary) (or equivalent dilution) for a period of 10 minutes. Ventilate buildings and other closed spaces. Do not use equipment until treatment has been absorbed, set or dried. FUNGICIDAL ACTIVITY: At the 1 ounce per gallon dilution, this product is fungicidal against the pathogenic fungi, Trichophyton mentagrophytes (Athlete’s Foot Fungus) (a cause of ringworm of the foot) and Candida albicans. Apply solution with a cloth, sponge or hand pump trigger sprayer to hard, nonporous surfaces found in bathrooms, shower stalls, locker rooms, exercise facilities or other clean, hard nonporous surfaces commonly contacted by bare feet. Allow the surface to remain wet for 10 minutes, then remove excess liquid. Diluted product should be applied daily or more frequently with heavy facility use. *VIRUCIDAL ACTIVITY: This product when used on environmental, inanimate, hard, nonporous surfaces exhibits effective virucidal activity against HIV-1, HIV-2, Hepatitis B virus (HBV), Hepatitis C virus (HCV), Herpes Simplex Type 1, Herpes Simplex Type 2, Influenza A2 /Hong Kong, Vaccinia, Rotavirus, Human Coronavirus (ATCC VR-740), SARS associated Coronavirus, Bovine Viral Diarrhea Virus (BVDV), Pseudorabies, Bovine Rhinotracheitis, Feline Leukemia, Feline Picornavirus, Avian Influenza A Virus and Canine Distemper Virus. Add 1 ounce of the product per gallon of water. For heavily soiled areas, a pre-cleaning step is required. Apply solution with a cloth, mop, sponge, hand pump trigger sprayer or low pressure coarse sprayer so as to wet all surfaces thoroughly. Allow the surface to remain wet for 10 minutes, then remove excess liquid. KILLS HIV-1, HIV-2, HBV, and HCV ON PRE-CLEANED ENVIRONMENTAL SURFACES/OBJECTS PREVIOUSLY SOILED WITH BLOOD/BODY FLUIDS in health care settings (Hospitals, Nursing Homes) or other settings in which there is an expected likelihood of soiling of inanimate surfaces/objects with blood or body fluids, and in which the surfaces/objects likely to be soiled with blood or body fluids can be associated with the potential for transmission of Human Immunodeficiency Virus Type 1 and Type 2 (HIV-1 and HIV-2) (associated with AIDS), Hepatitis B virus (HBV) and Hepatitis C virus (HCV). SPECIAL INSTRUCTIONS FOR CLEANING AND DECONTAMINATION AGAINST HIV-1, HIV-2, HBV, and HCV ON SURFACES/OBJECTS SOILED WITH BLOOD/BODY FLUIDS. PERSONAL PROTECTION: When handling items soiled with blood or body fluids, use disposable latex gloves, gowns, masks and eye coverings. CLEANING PROCEDURES: Blood and other body fluids must be thoroughly cleaned from surfaces and objects before application of this product. CONTACT TIME: Allow surface to remain wet for 10 minutes. DISPOSAL OF INFECTIOUS MATERIALS: Blood and other body fluids should be autoclaved and disposed of according to local regulations for infectious waste disposal. GENERAL CLEANING: Apply this product to soiled area with a mop, cloth, sponge, hand pump trigger sprayer or low pressure coarse sprayer. This product can be diluted at 1 ounce per gallon or applied at full strength. Thoroughly wet soiled surface and scrub as necessary. DEODORIZATION: To deodorize, apply this product as indicated under the heading DISINFECTION. Veterinary Practice/Animal Care Animal Laboratory/Zoos/Pet Shop/Kennels Disinfection Directions: For cleaning and disinfecting the following hard nonporous surfaces: equipment not used for animal food or water, utensils, instruments, cages, kennels, stables, catteries, etc. Remove all animals and feed from premises, animal transportation vehicles, crates, etc. Remove all litter, droppings and manure from floors, walls and surfaces occupied or traversed by animals. Thoroughly clean all surfaces with soap or detergent and rinse with water. Saturate surfaces with a use-solution of 1 ounce of this product per gallon of water for a period of 10 minutes. Ventilate buildings and other closed spaces. Do not house animals or employ equipment until treatment has been absorbed, set or dried. Disinfection of Hard Nonporous Surfaces in Whirlpool Units: After using the whirlpool unit, drain and refill with fresh water to just cover the intake valve. Add 1 ounce of this product for each gallon of fresh water added. Start the pump to circulate the solution. Wash down the unit sides, seat of the chair, lift and any/all related equipment with a clean swab, brush or sponge. Treated surfaces must remain wet for 10 minutes. After the unit has been thoroughly cleaned, drain the solution from the unit and rinse any/all cleaned surfaces with fresh water. Repeat for heavy soiled units.